The charming canals of Venice are just a train ride away. All photos by Erica Firpo unless stated. 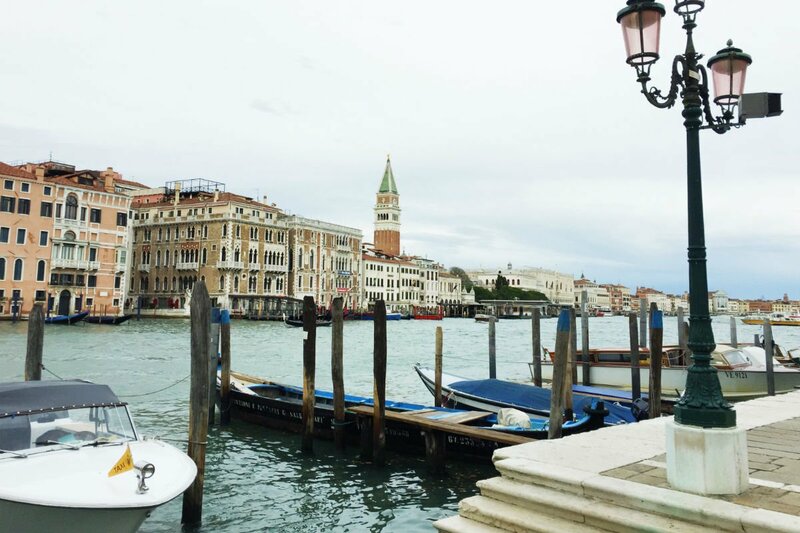 A day trip from Rome to Venice? Is that even possible? Absolutely. Our Rome-based editor, Erica Firpo, has the plan. VENICE – "Where should I go for a day trip out of Rome?" That's probably the most popular question question people ask me when planning a trip to Italy. Tivoli, Napoli, Cività di Bagnoreggio, Bomarzo, Caserta, Spoleto, Siena ... there are so many sites, towns, and cities up my sleeve — all within reasonable distance. But here's one I never, until now, bothered to suggest: Venice. Venice? Impossible from Rome, you say. It’s on the other side of the boot! Not at all. Door-to-door, Roma Termini to Venezia Santa Lucia is a three-hour and 45 minute train on the Italo, the alta velocità (high speed) train. Double down for the return, and that’s just under eight hours seated, time you can use to contemplate time travel and catch up on most of the first season of Dark. Is a day trip too ambitious and frivolous? Yes, just like Venice and, at times, just like me. But look: You’re trying to maximize your precious time in Italy, right? 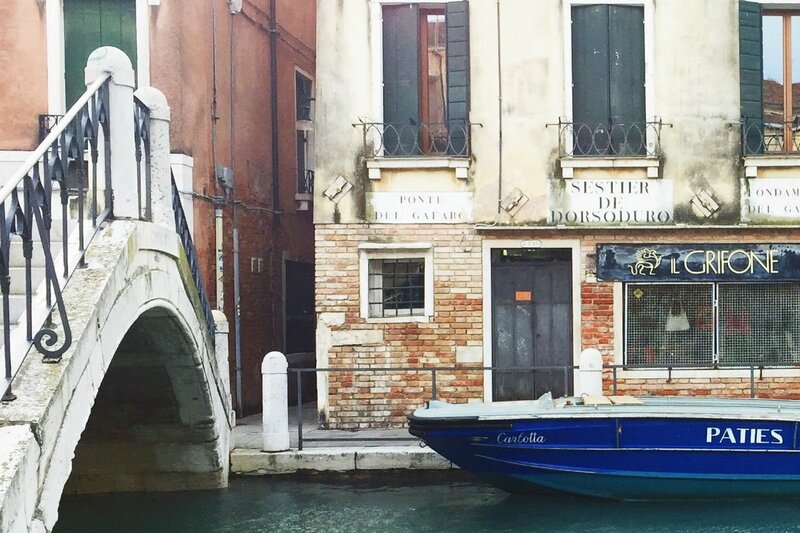 Meet your mode of transportation in Venice. Whether meandering or hitting the must-sees, you’ll need to have a plan. Download a Google Map beforehand to know where you’re going and how you’ll get there. Your choices are walking, water bus, and water taxi. If you want to be clever, customize a My Maps by dropping pins on cultural and food sites and download it onto your phone. (Here’s mine.) You're in for a long day, so I suggest powering up on protein and excitement (or else a lot of espresso) and wearing your most comfortable (and waterproof) walking shoes. Most importantly, know where you're going to eat. For the day-tripper, my only suggestion (and my latest mantra) is get thee to a few bacari. A bacaro is a no-frills bar overflowing with people queued up for cicchetti, those whimsical Venetian appetizers, like creamed cod, pickled onions, and braised artichokes on bread, that are usually accompanied by a glass of wine. Service is quick once you are front and center at the counter. My best tip: Keep spare euro in your pocket not only for cicchetti but also for the vaporetto, Venice's water bus system. The one-day fare costs €20, while a single, 75-minute fare is €7.50 and can be bought on board. Again, cash is king and makes everything go faster. From the Santa Lucia station, take the #2 vaporetto to the San Marco stop, or, if you feel like walking, take Strada Nuova through Canareggio to San Marco, approximately 25 minutes. When you feel like you're getting lost, just look for the ubiquitous yellow "San Marco" signs on the walls with arrows indicating the path. Piazza San Marco. This is it, and you're in awe. It is just like you imagined, down to the pigeons. But you need a little energy boost. Head to Grancaffè Quadri, one of Venice's oldest cafes on Piazza San Marco (now run by the Alajmo brothers, who also own the three-Michelin-starred Le Calandre), for a cappuccino in a stunning setting, or to Rosa Salva for a hearty krapfen, a sweet, deep-fried dough filled with cream. You are ready and you should be thinking of going up. 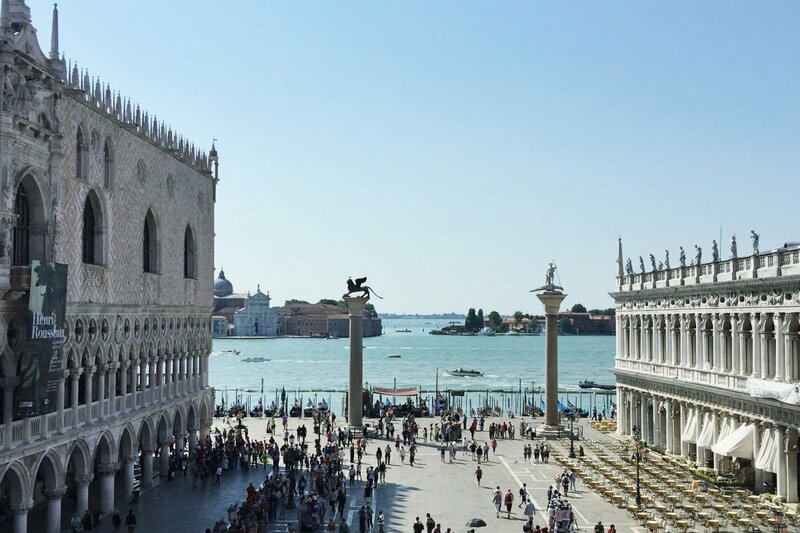 Make sure you wait until it's past the hour, then take the elevator to the top of the iconic San Marco bell tower for a 360-degree view of Venice. 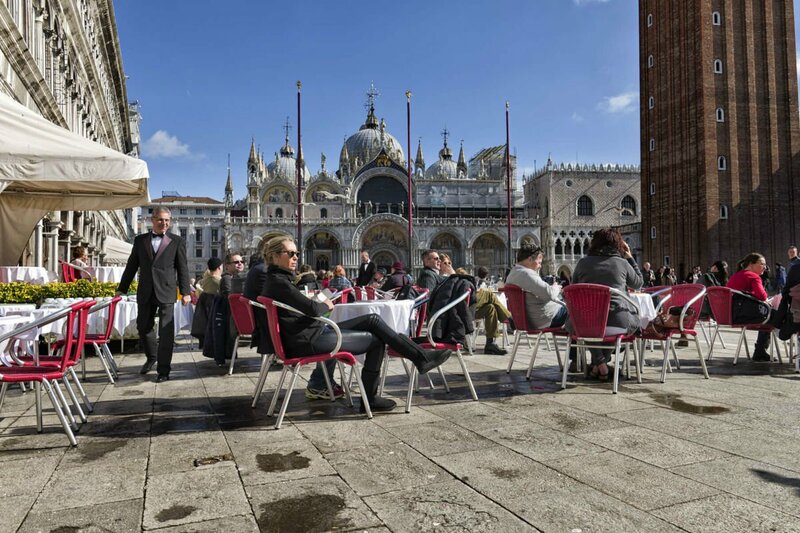 Or head to the terrace of Basilica San Marco. There rest of the day is up to you. My preference? Grab a spot in a campo (square) and enjoy the view. My favorites? Campo Santa Maria in Formosa, Campo Santo Stefano, and Campo della Pescara by the Rialto Bridge. There is nothing better to do in Venice than watch the city. The perfect place for people watching: San Marco. Is your stomach growling? I thought so. Time for cicchetti. My go-to bacari are Da Fiore (San Marco/Santo Stefano), Cantine del Vino già Schiavi (Dorsoduro), and Osteria da Carla (San Marco). Order a glass of wine and bacalà mantecato, the local cod dish on toast, and anything else that catches your eye. Don't be afraid of the sardines: Sweet and sour sarde in saor are delicious. Once you've filled up, you'll need to get moving, especially if the crowds inside pick up. If you're thinking about a gondola ride (it's okay if you want to be touristy), head outside the Piazza San Marco area to Rialto or Cà Sagredo and give yourself at least an hour for the ride. 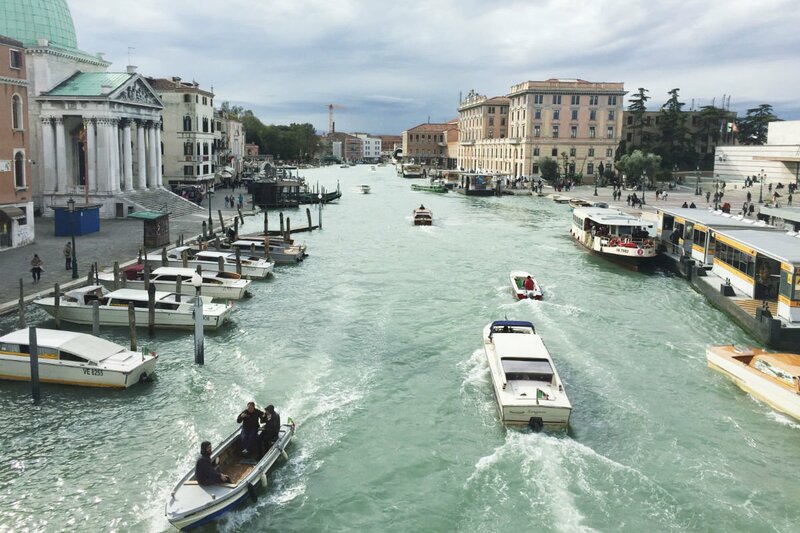 Since I don't particularly care for gondola prices and never feel like I have enough time, I take the charming traghetto that crosses the Canal at Giglio near the Gritti Palace to Dorsoduro in a 30-second boat ride. The traghetto is my discount option to a gondola. It's a gondola ferry without the frills and only costs €2 for a one-way ride. The traghetto seats up to ten people, all close together, so by the time you've crossed, you've made new friends. Rows of gondolas and water taxi's line the canals. I always try to visit one museum in Venice, and lately I've been suggesting Peggy Guggenheim Collection, not simply because I used to work there, but because the water-side palace is beautiful and the collection of modern and somewhat contemporary art is unique, just like Peggy herself. Otherwise, Galleria dell'Accademia shows the incredible history of Venice through master paintings. Time is winding down, and so should you. Walk to the end of Dorsoduro to Santa Maria della Salute, a beautiful Baroque church on the water's edge. This is your picture-perfect moment. Remember your train is at 7 p.m., and you may very well be on the other side of Venice. You could take a water taxi for €50+ back to the station, but why not plan to start walking (or take the vaporetto) at 6? Hopefully, you'll be at Venezia Santa Lucia in time. If not, you have another day in Venice. See all our favorites in Fathom's Guide to Rome and Venice — and for a concierge in your pocket, download our three-day itineraries for Rome and Venice. Then don't miss Erica's story about Al Moro, one of her favorite restaurants in Rome, and her Roman walking tour for know-it-alls of all ages.